You have to work for the government you want, or else someone else will give it to you. The world is feeling that today, this entire weekend, as folks in the U.S. prepare to stand toe-to-toe with forces threatening to roll back a half-century of hard-won social gains. Last night, I was in a room full of people who believe in working for the city they want, and who have the willfulness and energy to do the endless groundwork. 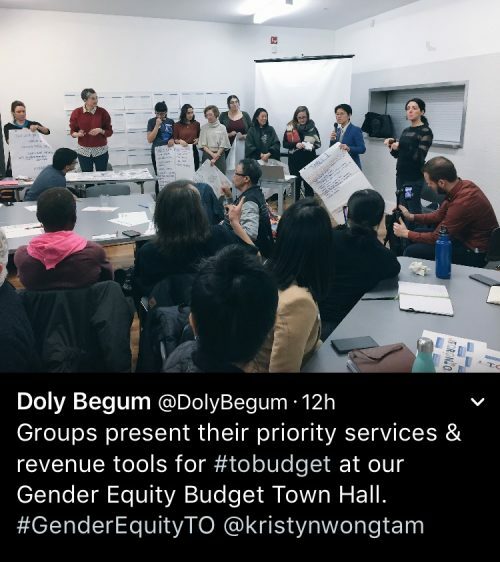 Here’s a snapshot of one corner of the room at a Forum on Gender Equity in the Toronto City Budget organized by Councillor Kristyn Wong-Tam. 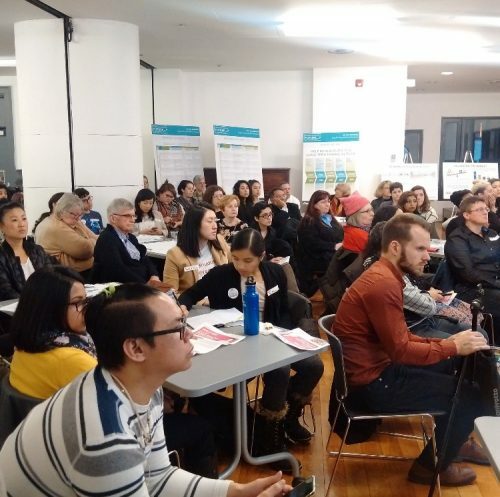 A diverse crowd came to hear the presentations and insights of NGO’s, including the Toronto Women’s Habitat, Toronto Women’s City Alliance, Social Planning Toronto and the YWCA. I was there to listen and draw their stories. 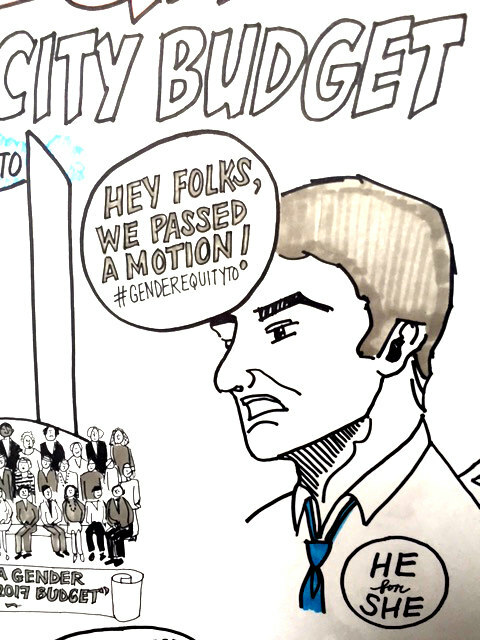 In a nutshell, last July Toronto City Council passed a motion to cast a gender equity lens on the 2017 budget. 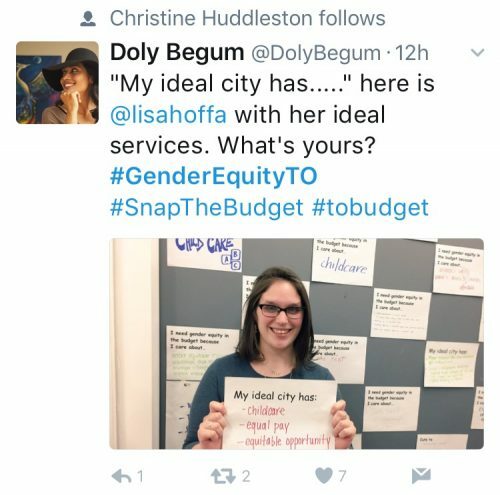 It was the first time in Toronto’s history that a City Council has agreed to act on the fact that women’s economic inequality is built into the system. 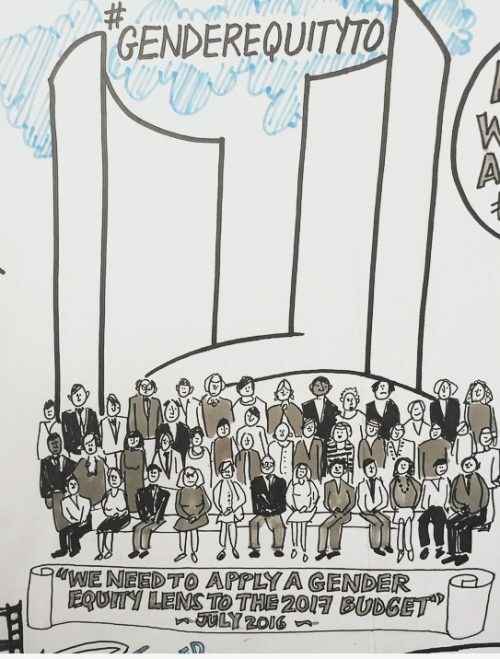 Government policies are not, and have never been, gender neutral. 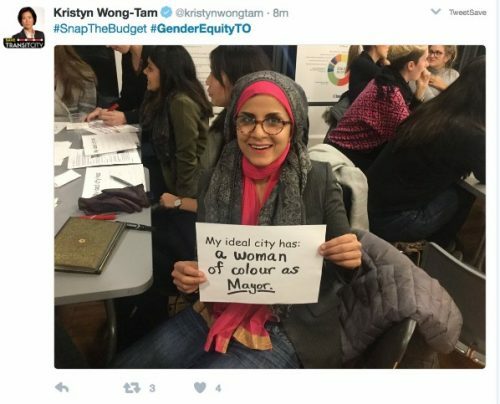 FYI: Women are 52% of the city and make 68 cents to a man’s dollar, as Wong-Tam pointed out in her presentation. 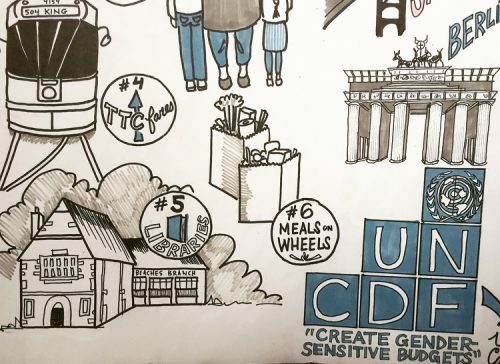 I recently interviewed the creative directors at the Toronto arm of the ad agency, BBDO. The women in that office were so ticked off by these unjustified extra charges, they teamed up with the feminist website, GirlTalkHQ, and made this pro-bono video to illustrate one aspect of women’s everyday experience. BBDO also created a petition asking for Prime Minister Trudeau’s help in closing the gender wage and price gaps. 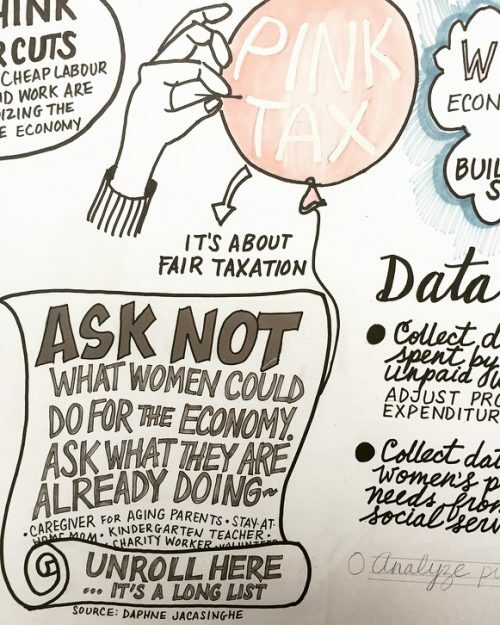 Feel free to sign it if you agree the “Pink Tax” makes no sense. By the way, BBDO is the agency that inspired “Sterling Cooper,” Matt Weiner’s fictional agency in Mad Men. Peggy and Joan would be happy to hear that 40% of the top brass at BBDO TO are women. Like the film industry, when women have a place at the table, our concerns and lived experiences are turned into stories available to everybody. And we all know how stories can change the world! 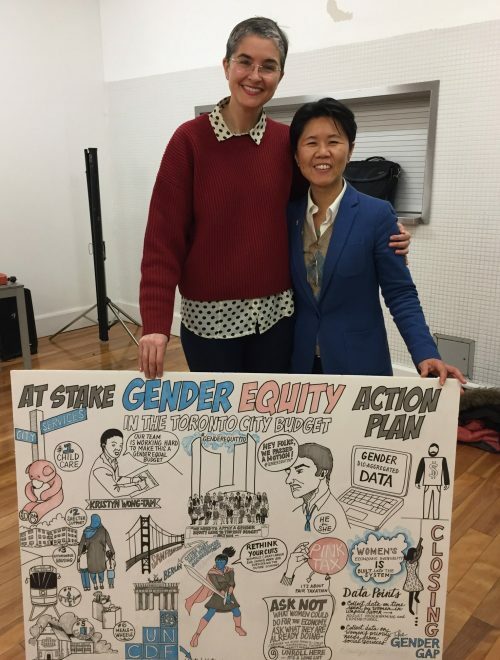 Wong-Tam, who is calling for an open and transparent budget, is encouraging her colleagues to analyze the gender-disaggregated data collected by the attending NGO’s. 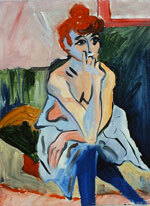 It shows how cuts affect women differently than men. By the way, when you add on other identities on top of gender — like Aboriginal status, sexual identity, culture, creed, religion, language, citizenship, income, disability and age to the mix — the inequities are compounded Big-Time. 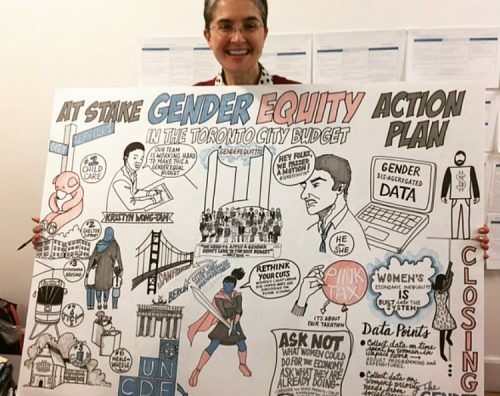 So far, one hundred and fifty cities around the world, including San Francisco and Berlin, have introduced gender budgets. 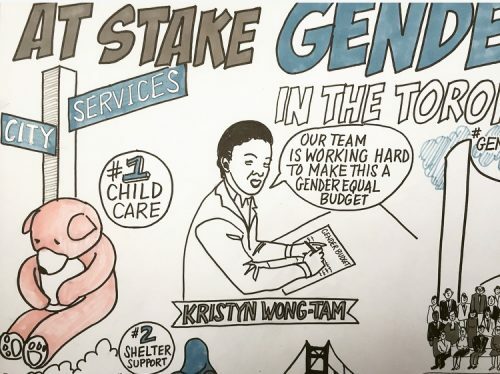 The first country in the world to enact “gender-responsive budgeting,” as the academics like to call it, was Australia back in 1984. Inspired by the Australians, South Africa’s post-apartheid government went on to create a “Women’s Budget Initiative” in the mid-1990s. Work is far from finished in South Africa. In the meantime, 90 countries have been experimenting with various forms of gender equal budgets, according to this 2014 OECD report. Again, results have been mixed. The status quo is a stubborn beast. Libraries are key hubs, not least of which because they have free wifi. I did my best to capture the spirit of the issues. City Council will debate the budget cuts on February 15. 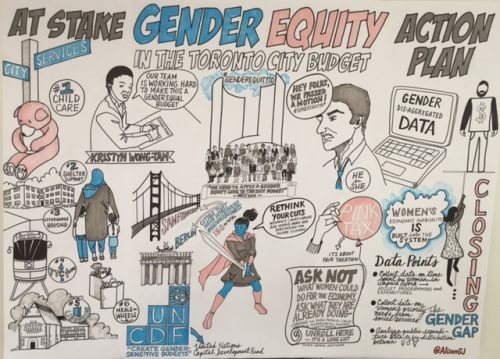 If you want to see a gender equity lens applied to programming and expenditures, contact your city councillor and Tweet up a storm with the #GenderEquityTo hashtag. 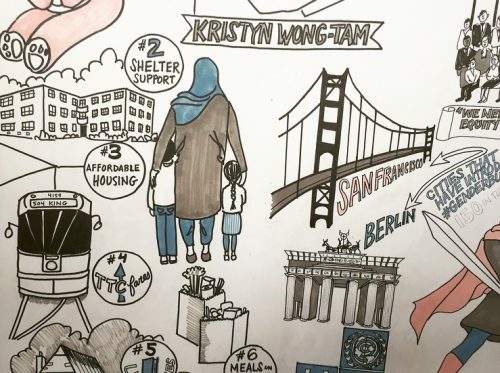 Councillor Wong-Tam will need the support. Next step: deliver the board to City Hall.